Mongolian fashion designer Tsolmandakh Munkhuu picked up the "Public Prize" a month or so ago at the annual Hyeres Festival of Photography and Fashion. I can't find much information on her, apart from few bits and pieces from other blogs: she is 30, apparently graduated from Atelier Chardon Savard, and lives and works in Paris. Nevertheless, it's awesome to see someone getting a break in a creative industry on a world stage. And I just love the detail on those clothes, and the traditional Mongolian looking shoulder parts on the dresses are just superb! And it's all black! BLACK! How can anyone not love it? 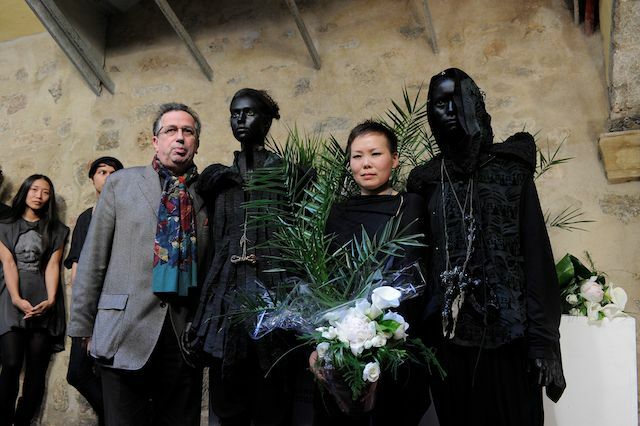 Hyeres Festival is run since 1985, and Viktor & Rolf got their break through Hyeres in 1993.